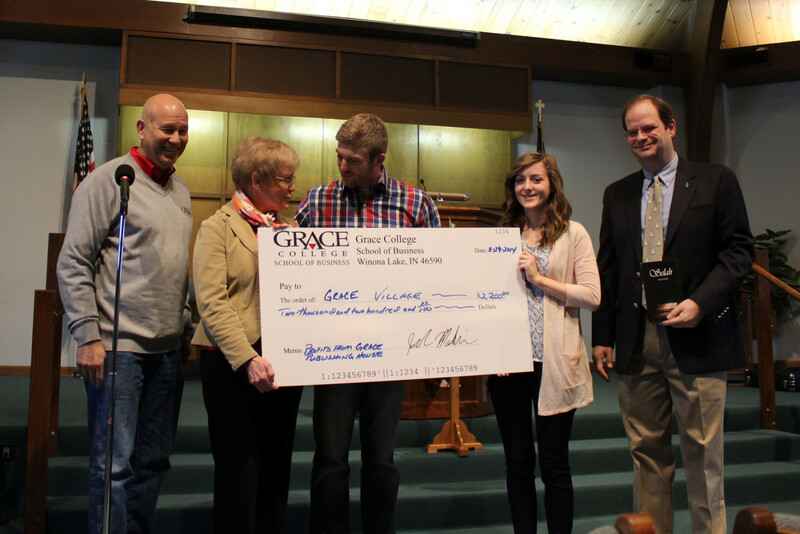 Students in the Grace College Entrepreneurship and Business Practicum class held an event at Grace Village and donated the proceeds of their business class project to Grace Village in the sum of $2,200. Pictured from left to right are Grace College President Bill Katip, Carol Buhlman, Jacob Mackin, Georgi Sandlin, and Dr. Jeff Fawcett. Students in the Grace College Entrepreneurship and Business Practicum class recently got a practical lesson in running a business while supporting a local not-for-profit organization. The class decided to invest in Grace Village, and each member of the class contributed at least 10 hours, combining for more than 240 hours of total volunteer work. 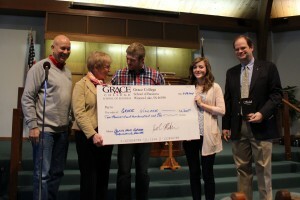 To fulfill the financial investment portion of the class, the class published and sold copies of a devotional written by members of the Grace faculty and donated the profits to Grace Village, the local retirement community that is a cooperating ministry in the Fellowship of Grace Brethren Churches. They invited President Katip to contribute to the evening’s festivities by playing the piano and mingling with the attendees. On March 29, they celebrated with a party and presented the proceeds of their class project in the sum of $2,200 to Grace Village. Grace President Dr. Bill Katip was present at the event to play the piano and spend time with the students and seniors. Stock Up on BMH Classics at Spring Warehouse Sale!